A slow-down day . . .
Andrea Patterson	Fall Banding	Comments Off on A slow-down day . . .
Wednesday October 29, 2014: 24 new birds of 7 species; 22 recaps. No new species. Bird of the day is Black-capped Chickadee with 12 new bands. Thermometer insisted it was near 50 degrees today, but the gray gloomy skies made it seem cold and dreary. The birds seemed to feel it too, as they were scarce until the very end of the day when the sun came out. We got more than 1/3 of our new birds on the last net run . . . maybe we should have started later, and stayed open later! A lovely Red-bellied Woodpecker made our day. 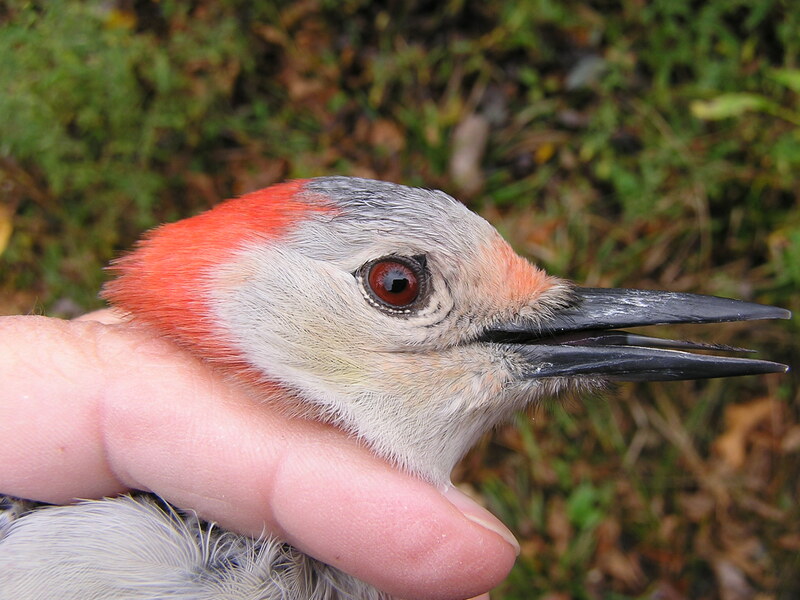 This one is a second-year female bird; notice the replaced outer primary coverts (which is indicative of a second-year bird in the fall) and the reddish eye. Outer four primary coverts are darker than the inner primary coverts. 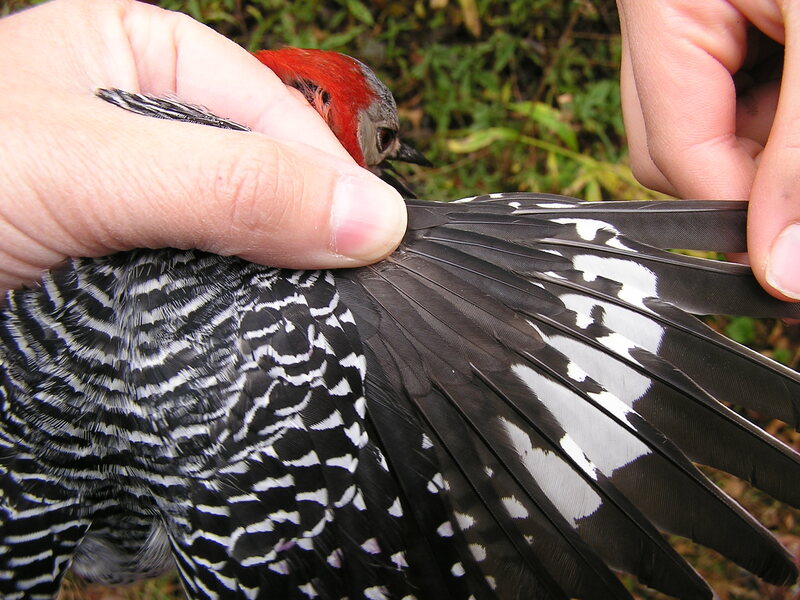 They have been recently replaced, which is a typical molt pattern for a second-year fall bird. 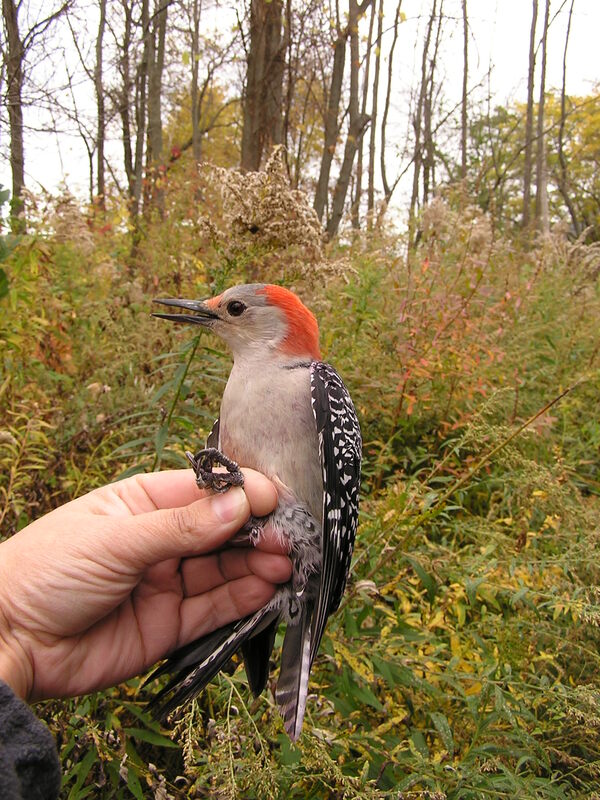 A reddish eye indicates an adult bird in many woodpeckers. Young birds often have muddy grey or brownish eyes, that gradually redden with age.